Spokane is located in the heart of the Inland Northwest and is the second most populous city in Washington. The Spokane River runs through the city and beautiful Riverfront Park in downtown Spokane. An array of enjoyable outdoor activities are right out our back door; including ski resorts, white-water rafting, camping areas, hiking trails, lakes, and the Centennial trail. Small enough to be relaxed, large enough to facilitate international flights, the Spokane International Airport is about eight miles (a 15 minute drive) from the 2018 ELUNA Convention site. Public Transportation: Spokane Transit Authority runs buses between downtown Spokane and the airport. Various fare options range from a $4.00 day pass to a two-hour pass at $1.75. Please visit the STA website for further information. The Grand is sold out. See below for information to book at the DoubleTree at Spokane City Center at our special conference rate of $139 now! ELUNA 2018 takes place at Spokane’s modern jewel- The Davenport Grand. The hotel is within walking distance of world-class shopping and dining options, the beautiful Spokane River and Riverfront Park, the Centennial Trail and the INB Performing Arts Center. The modern and stylish rooms features comfortable furnishings, large marble walk-in showers, custom-made down pillow top mattresses with fine linens, free high-speed wireless internet, iron and ironing boards, hair dryers, 55-inch flat-panel TVs and large work spaces. The Grand also offers many other amenities, such as 24-hour access to both a business center and fitness center. The Grand offers airport transportation and group shuttles van service (by reservation) for a fee. Doubletree Hotel is sold out for Tuesday – Thursday. The ELUNA block at the Doubletree is now sold out. We may be able to help with reservations for Sunday, Monday, or Friday night onlyat the block rate of $139. If you need a room for a shorter stay, please send a note to contact.eluna@gmail.com. ELUNA has secured the same $139 rate at the Doubletree by Hilton Spokane City Center, conveniently located across the street from the Davenport Grand. This property is a lovely short walk (600 steps) over the river and through the woods to the Davenport Grant, or plan to hop on a complimentary shuttle provided by Ex Libris. Reservations can be made over the phone until the hotel is sold out (1-800-Red-LION; note that you are with the “ EXLI0429 ” to receive the lowest rate). 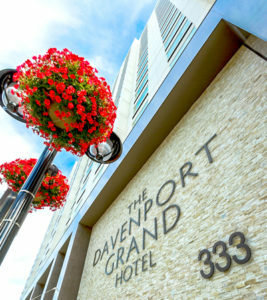 Use this link to visit a our suggestions for local downtown Spokane attractions, all within walking distance of the Davenport Grand!